The Plugin Cordova PayPal was developed by Cranberrygame and is available in the Full Package (premium). If you don’t have the Premium Access you can purchase a key here. Please note that Google Play doesn’t allow other payments than their own! So you can’t upload an APK file using PayPal to the Google Play Store. Then register or login into an existing account at PayPal Developer. Name your app and confirm by clicking the ‘Create App’ button. 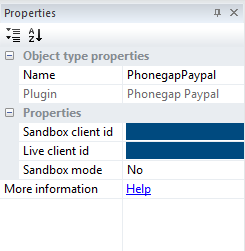 Copy once the Client ID at the ‘Sandbox’ and once at the ‘Live’ Tab and insert those two ID’s to your C2 Project. Enter the ID’s above at the plugin in your Construct 2 Project. If you want to use the advanced mode you must adjust the file included in the C2 Project at files/PayPal/paypal.php. Enter your Secret and Client ID and save the file.